This entry was posted in birds, Ozarks, Photography, wildlife and tagged Arkansas, bird feeding, birding, birds, flash photography, Hummingbirds, Olympus, Olympus E-M5, Ozarks, photography, wildlife by artsifrtsy. Bookmark the permalink. Lorri, it is so fascinating to hear how you perform your magic. But even with you telling me the secrets I think I will stick with looking at your photos! That video is amazing – I had no idea. I have seen them flick their tongues, but had no clue it split like that. I knew you’d like the video. I am always so impressed by your photos — and by your different trials. Fascinating. You are always educating me, Lorri! This is so interesting! I just look at your work and see how talented and creative you are! Well thanks Paula, I’m just exploring. Sometimes it works, sometimes, not so much. I love that set – I had so many shots, her eyes were at the right angle to not show the flash. They perch like that to guard their feeders, it’s the only time they hold still. Hello Jules, great to hear from you – they are fascinating little creatures for sure. It really is incredibly rare, I’ve never seen one hold still or even land. Your photos a great, but they are so much more awesome because what you photographed is so rare! I liked your ending. Interesting post as you describe how you are meeting this new challenge. I had heard that stock photography was quite demanding in those areas. I suppose that’s one of the reasons why I haven’t pursued them. Thanks Lyle. I use stock photography in my work and have never been super impressed with it, but seeing the other side I get it. I know I need to shoot some things that are meant specifically for stock use. I’m just trying to figure out if it’s worth the effort. I hope that works out well for you. Some people get steady income from it. Great shots Lorri. I’m amazed how well lit the birds are (with the flash). I’ve never been a fan of flash photography on the rare times I have used it, so I suppose it must take a bit of practice. (I do have the ring flash on my shopping list for flower photography though). Now I have the plaster cast off my broken right arm, can’t wait for the day when I can manage to carry my DSLR – i am missing so many lovely Spring flower shots.). Thanks Vicki, good to hear that you are on the mend! Overall I’m finding the biggest challenge is to get a good focus in low light. The cycling of the flash does slow you down. I have on,y a pretty basic flash right now. I want one of those macro rings too! wow! I have no technical input at all but love the outcome of the flashy bits. Thank you once again for the exceptional view of a bird feeding feast! Thanks so much – these guys are wonderful to watch! I follow several local photographers and I see so much work so frequently that amazes me that I have never been super confident in my photos – I have learned what people buy, but I always see the short comings. I think most artists do – and typically most non-artists don’t notice them. I think I was taken aback by the technical nature of stock photography – but that is pushing me to try new things, so it’s all good. Wow! The hummingbird shots are amazing. Thank you for sharing how you did it. I would never have thought to use the flash (it’s not my favorite piece of photographic equipment either). Thanks Robin – Now that I have tried the flash it makes total sense. It’s another piece of equipment I need to learn more about using. Absolutely breathtaking! 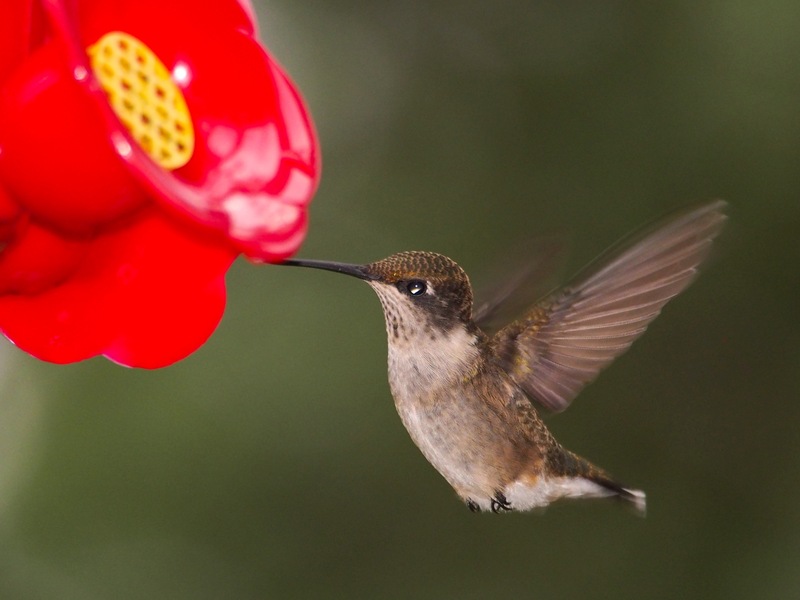 I have been trying to learn how to take great shots of hummingbirds and this is not only a great tutorial but beautiful as well! The bokeh is so creamy. What lens do you use to capture? Thanks, I shoot Micro 4/3 so the numbers are half that of a 35mm. My bird lens is a 75-300mm or a 150-600mm equivalent. It’s a sharp lens already – but the more light it gets the better. What system do you shoot? I find that hummers will let you get really close when they are serious about feeding – my brother has had them feed from a small feeder in his hand. I shoot Nikon. I’ve been thinking about making the switch to Canon because the lens tend to be a little less expensive than Nikon lenses. I shoot Nikon at work and love it. I used to shoot Canons, but they didn’t always interface well with our studio equipment. Both make some nice kit. I shoot Olympus myself – love the color. Thank you for sharing not only great photos, but also the techniques you have used. We don’t get many humming birds where I live, actually we don’t get ANY, but I enjoyed the learning experience. 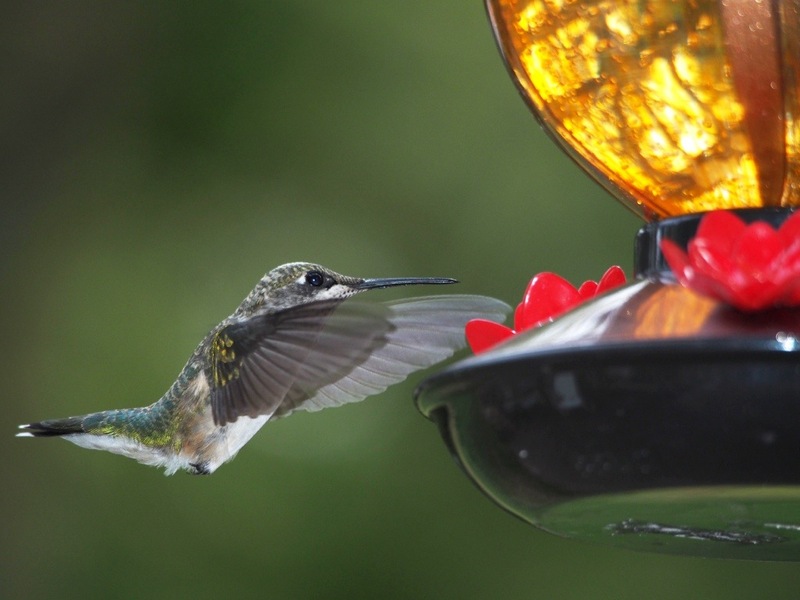 I love my hummers – but they are a challenge, I am constantly trying new things to see if I can get better images. You may attribute that previous comment to me. For some reason, my comment above came through as “anonymous”. Sigh. No worries – I am shooting through my long lens. How does your FPS speed work with a flash needing to recharge. I may need a flash upgrade 🙂 I hadn’t considered focus tracking but I will definitely give that a shot – thanks for the tips! I use the flash on manual and it goes up to 1/250 for shutter speed. Nonetheless, my camera (Canon 1-DX) is super-fast and, coupled with the Servo focus mode, has captured some neat images. If you aren’t using AI Servo, I highly recommend you do so as it will really make those “keepers” eye-popping. I wrote a couple of blog posts regarding my own photography with the hummingbirds and I also have a hummingbird gallery on my photo website. Yes, mine goes up to 250 shutter speed as well. I think I can get 9 fps. My flash just won’t fire that fast though. I have a more complex one I need to read up on – perhaps that will do the trick. Basically before this week I used a flash to shoot interiors when I absolutely had no other option. But I have been reading up on using it for macro – this was literally a shot in the dark. I am trying continuous focus tonight for sure! Your hummingbird shots are awesome! Thanks Kathleen – are they still active in your corner of the Ozarks? No, not as many and they appear to be new arrivals – skittish and not sure where to feed. I will keep the feeders out for another few weeks, then its time to bring them in -will probably leave a small one out just in case there is a straggler. Hard to believe its already time for them to pack up for Central Am! I have had dozens all summer – 6 feeders filled every Saturday – I’m on my third 5 pound bag of sugar:) I’m going to miss the little beggars. Every September, the hummingbirds migrate through my part of southeast Texas on their long migratory route from Canada down to Central America and Mexico. My mother sets out feeders in her backyard and the hummingbirds swarm around them. I have managed to capture some awesome images using flash, a long lens (my Canon 100-400mm) and setting the focus mode on AI Servo so that the focus point keeps tracking the moving subject (aka the hummingbird). I shoot most of my images handheld but have used the tripod as well for these hummer images. It also helps to have a camera that has a fast fps – paticularly when shooting in Raw rather than jpg.